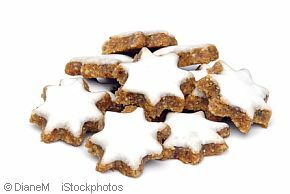 Zimtsterne are the most traditional German Christmas cookies. 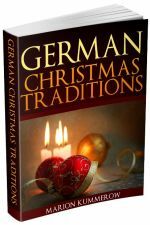 It is hard to imagine Weihnachten without this delicious treat. The cookies are made without flour, so they are ideal for everyone on a gluten-free diet. They are not diffucult to make, but it takes some time for cooling and drying the dough. The result is just heavenly. 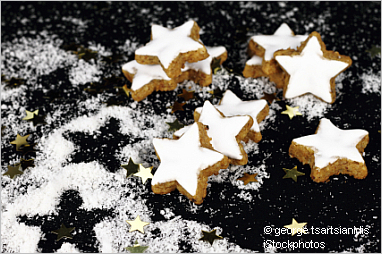 And yes, you bake cinnamon stars with the glaze, although some people might tell you to glaze them after baking. Whisk the egg whites with a hand mixer set to high speed. Add the sifted icing sugar little by little. When the egg white / sugar mix is stiff, remove 3 tablespoons and keep it for the glaze. Add vanilla sugar, cinnamon and half of the almonds to the egg white using low speed of the hand mixer. Add the rest of the almonds using a spatula or your hands kneading the dough. Wrap the dough in clingfilm and refrigerate it for at least 1 hour. Dust a board and rolling pin with icing sugar, roll out the dough about 1cm (1/2 inch) thick. Cut out the cookies with star-shaped cookie cutters. Put the cookies on a baking sheet lined with parchment paper. Stir the remaining egg white carefully until it is soft and smooth. If necessary add a few drops water or lemon juice. Cover the top of the Zimtsterne with the glaze, work it out to all points by using a teaspoon or a fine brush. Let the cookies dry a few hours / over night before you bake them. Put them in the cold oven, but remove them when you preheat the oven! Bake at 140°C (275°F) in a preheated oven for about 25 minutes. Don't turn the fan on if you have a fan oven, the topping might get brown before the cookies are ready. Put the parchment paper with the Zimtsterne on a cooling rack. Carefully remove the cookies from the paper with a spatula when they are cold. If the dough is too sticky, add some more almonds, or refrigerate it again. 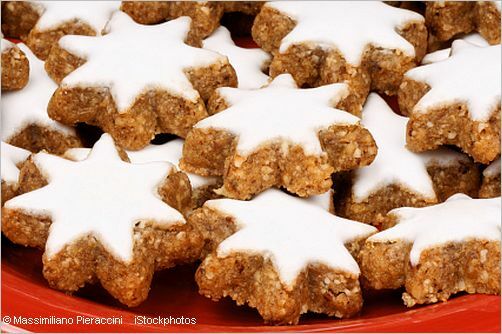 Never use flour for cinnamon stars! Wet the cookie cutters with water, and remove remaining dough frequently. Ovens are different, baking time might differ. Always watch the cookies while they are in the oven. The glaze should remain white, and the Zimtsterne should be a little soft underneath when they come out of the oven. Store the cool cookies in a tight tin, when they are too hard, add a apple slice. However, exchange the apple frequently, it can turn mouldy. Enjoy the Zimtsterne, guten Appetit!